後脚が張り出した緊張感のあるフォルムが特徴的。板材は薄く、棒材の先端は細く削り込み、最小限の部材で構成した軽量な椅子。姿形は異なるがhozukiの貫の技術を応用していることから "-zuki" を共通させたネーミングとした。湾曲した板面、丸く削ったフレームにダイナミックな木目が浮かび上がる。 This chair is characterized by its form with a sense of tension in which the back legs are curved toward the back of the chair. 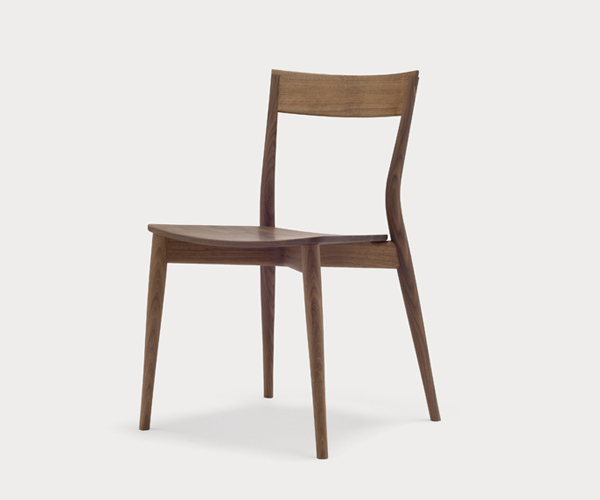 It's a lightweight chair constructed with a minimal set of materials having slim boards and tapered bars. Although the overall shape is different, its predecessor, "hozuki" has the same structure in which stretchers are crossed under the seat. Thus, the name with the same suffix, "-zuki". The curved boards and the round carved frames display dynamic wood grain.